A young entrepreneur from east Hull who overcame homelessness has been commended at a major awards at the House of Commons. Aaron Conroy says he is now planning on acting on tips he has received from the very top after rubbing shoulders with politicians and international business people at the glitzy event. 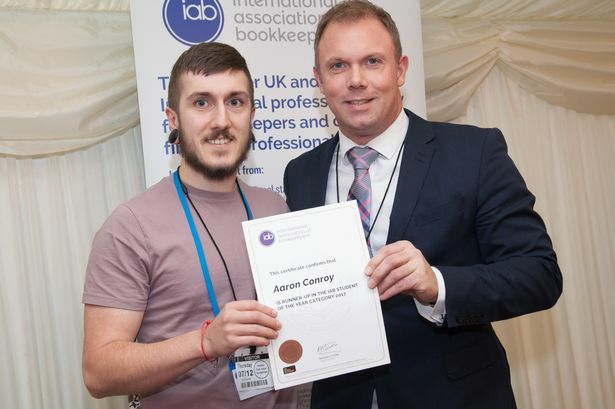 Mr Conroy, who overcame the obstacles of joblessness and homelessness to launch his own business, was recognised by being named runner-up in the International Association of Bookkeepers (IAB) Student of the Year award. Mr Conroy was nominated for the global award by Hull-based Golding Computer Services, where he completed the IAB Level 1 Certificate in Computerised Accounting for Business as part of the Making Changes for Careers (MC4C) initiative. He is now progressing with Goldings to Level 2, having seized the opportunity to turn his life around. The entrepreneur says he had struggled through college courses and mundane jobs, even sleeping rough and sofa-surfing at times, but with the help of MC4C he launched Fenburg, selling watches, jewellery and other fashion accessories online. Mr Conroy said: “I used to live in London but it was a long time ago and I never went near the House of Commons. I was nervous and excited when we walked in and especially when they gave me a badge which had my business name on. “Being in the presence of MPs and international business people was very interesting and opened my eyes a bit. MC4C is part of the Humber Learning Consortium’s Youth Employment Initiative under Hull City Council’s regeneration services. The programme is supported by the European Social Fund and offers a lifeline for young people from underprivileged backgrounds who wanted to develop business ideas. Mr Wicks said: “As corporate associate partners to the IAB and sponsor of the Student of the Year Award, it’s really rewarding to see some of the new talent in the bookkeeping world emerging through the IAB.